Genuinely native Latvian literature is young, slightly over 150 years old. Yet it flows from a spring of Latvian folksongs that are centuries old. And once the literature began to develop it grew and expanded at a surprising speed, absorbing the trends of the West and combining them with local issues and flavours. Within 50 years, there were novels, plays, and stories, and we saw the golden age of Latvian classics. This collection includes traditional folk poems, extracts from longer Latvian classics, short stories, and poems. An introductory essay provides a historical overview of Latvian literature. 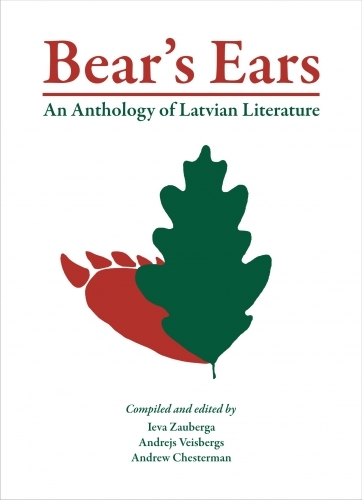 Following the success of the two previous editions of Bear’s Ears the compilers have expanded the anthology by adding four post-Second World War authors, thus providing a more complete picture of Latvian literature. The epic hero of Latvian literature is Lāčplēsis, Bearslayer. His ears are those of a bear, symbolising not only his great strength but also his ability to hear the voice of his people. Bearslayer appears several times in this anthology; the tragedy of his legendary story is balanced by the belief that he will return one day to bring freedom to his people. Has he returned?